INTRODUCTION: South Africa has made remarkable progress in rolling out antiretroviral therapy (ART), with the largest number of people (more than 1.4 million) enrolled on antiretrovirals in the world. Decentralisation of services to primary health centres (PHCs) has strengthened retention of patients on ART and reduced the burden of managing uncomplicated cases at referral hospitals. METHODS: This was a ten-step Nurse Initiatied Management of Antiretroviral Treatment (NIMART) rollout intervention in which nurses from 17 primary healthcare facilities of Region F, City of Johannesburg, South Africa, were trained and mentored in NIMART by the Wits Reproductive Health and HIV Research Institute (WRHI) to commence patients on ART in their PHCs. A total of 20 535 patients initiated ART during the 30-month study period. 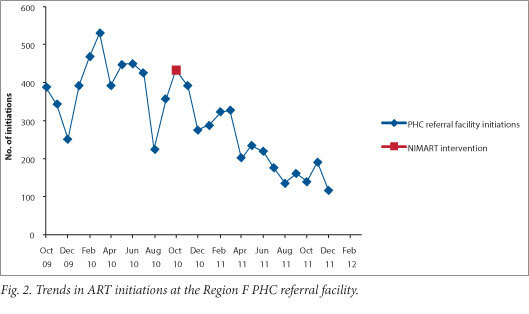 Monthly initiations at both PHCs and referral clinics were monitored. To test the statistical significance of the impact of NIMART rollout on the referral hospital initiations and Region F monthly initiations, interrupted time series analysis was applied. FINDINGS: Ten-step NIMART rollout was applied, with the first step being establishment of NIMART as a priority in order to obtain primary buy-in by the Department of Health (DoH) and City of Johannesburg (CoJ). Forty-five professional nurses were trained in NIMART by WRHI quality improvement mentors. By the end of September 2011, all 17 PHCs in Region F were initiating patients on ART. Total initiations significantly increased by 99 patients immediately after NIMART rollout (p=0.013) and continued to increase by an average of 9 every month (p=0.013), while referral facility initiations decreased by 12 (p=0.791) immediately after NIMART and then decreased by an average of 18 every month (p=0.01). CONCLUSION: In this study, decentralisation of ART initiation by professional nurses was shown to increase ART uptake and reduce workload at referral facilities, enabling them to concentrate on complicated cases. However, it is important to ensure capacity building, training and mentoring of nurses to integrate HIV services in order to reduce workload and provide a comprehensive package of care to patients. Engaging and having buy-in from DoH/CoJ partners in rolling out NIMART was crucial in increasing outputs as well as for sustainability of the NIMART programme. In the past 3 years, the SA government has been responsible for national initiatives aimed at increasing ART access. The HIV Counselling and Testing (HCT) campaign was launched in July 2010 with a target of testing 15 million people by June 2011, and in April 2010 there was a presidential mandate that ARVs be made available at all the country's 5 500 health facilities and that nurses be trained to prescribe and manage patients on the life-prolonging drugs. [12,13] By the end of 2009, 497 facilities were initiating patients on ART and by July 2010 the number had increased to 814. Initiation by nurses resulted in 2 552 facilities initiating patients by April 2011. The Wits Reproductive Health and HIV Research Institute (WRHI) is an internationally renowned African academic institute supporting Region F of the City of Johannesburg (CoJ) in rolling out NIMART through training and mentoring nurses. This is achieved through a multidisciplinary quality improvement mentoring team that has been collectively responsible for providing a comprehensive programme of technical assistance in quality improvement to 17 PHCs since 2010. The importance of mentoring NIMART nurses has been documented previously. [15,16] By October 2010, only one of the 17 PHCs in the region was initiating patients on ART. This meant that patients required referral to hospitals, which became overburdened with uncomplicated cases. The main purpose of rolling out NIMART to all Region F PHCs was therefore to increase access to ART services and reduce the workload at referral hospitals. We employed a quasi-experimental design with interrupted time series analysis to estimate the impact of NIMART on the number of patients initiating ART. The number of patients initiating ART monthly was collected before NIMART (October 2009 - September 2010) and after NIMART (October 2010 - March 2012). The intervention began in October 2010 and is ongoing. The analysis was exempted from ethical approval because it was an evaluation of an ongoing public health service programme. We included 20 535 ART-naive patients from Region F of the CoJ who were initiated on ART from October 2009 to March 2012. All patients transferred to Region F facilities from other regions or districts were excluded. A total of 6 957 patients (both adults and children) were initiated before the NIMART intervention and 13 578 after NIMART. Region F represents the inner city of central Johannesburg and has a population of 478 000 (District Health Information System (DHIS) database 2012). Nurses from the 17 PHCs in Region F were trained in NIMART over 5 days (3 days covered adult initiation and 2 days initiation in children). All nurses wrote pre- and post-tests during the course. The nurses were then supported and mentored in their PHCs by WRHI mentors to begin initiating patients on ART. The ten steps that were followed in rolling out NIMART to ensure buy-in and sustainability are shown in Fig. 1. Throughout the process the WRHI engaged with the Department of Health (DoH)/CoJ partners in order for them to share a common vision and aquire ownership of the programme, leading to sustainability. Data were collected from the PHCs' monthly reports. Monitoring of patients was undertaken on a monthly and quarterly basis. From May 2011, the number of patients initiated on ART through NIMART was also captured on the government-owned DHIS. Data over the clinics in the region were aggregated and recorded for each month over the study period. The primary outcome of the study was the number of patients in the 17 PHCs initiated on ART following NIMART intervention. Continuous data were expressed as means (standard deviation (SD)) or medians (interquartile range (IQR)). Categorical data were presented as frequencies and percentages. The Durbin-Watson statistic was used to test for autocorrelation. We modelled the time series data using segmented regression analysis of interrupted time series which, as suggested by Wagner et al.,[l7] has the advantage of controlling for baseline level and trend. We compared the time series pattern before and after the intervention to assess differences. The trends before and after the intervention were analysed to assess whether passage of time was associated with increased initiations. The change in average numbers of those initiating ART immediately after intervention was estimated and tested for significance. The specific model is: Yt = β0 + β1 * time + β2 * interventiont + β3 * time after interventiont + et, where Yt is the total number of new ART initiations in a month in Region F, which is the response variable in this model; time is a continuous variable indicating time in months at time t from the start of the observation period; intervention is an indicator for time t occurring before (intervention = 0) or after (intervention = 1) NIMART rollout, which was implemented at month j3 in the series; and time after intervention is a continuous variable counting the number of months after the intervention at time t, coded 0 before NIMART and 1 - 18 after NIMART. In this model, β0 is the estimate of baseline level of outcome, being the mean number of patients initiated on ART at time zero; β1 estimates the mean change in total number of ART initiations that occurred in each month before NIMART rollout, β2 estimates the level change in the mean number of initiations after NIMART; and β3 estimates the change in the trend in the mean monthly number of ART initiations after NIMART compared with the monthly trend before NIMART intervention. The error term et at time t represents the random variability not accounted for by the model. Data preparation was done in MS Excel 2010 and analysis in STATA 12, Stata Corp. Throughout we used a two-tailed t-test at a 5% level of significance. The WRHI NIMART mentoring team engaged with the CoJ and DoH partners in establishing NIMART rollout and all processes involved. This led to buy-in on the part of the CoJ, while the DoH had ownership and took the lead in rolling out the programme. This approach strengthened sustainability of the programme. Before NIMART rollout, only 1 of the 17 PHCs was initiating patients on ART, all undertaken by doctors. 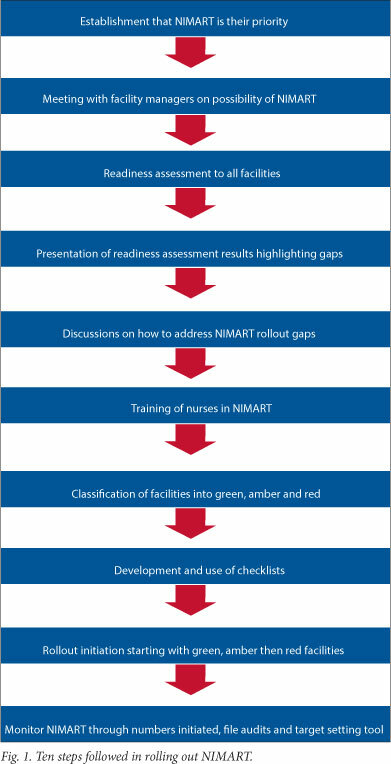 From October 2010, the WRHI started training and mentoring professional nurses in NIMART. By October 2011, all 17 facilities were initiating patients on ART with a sense of ownership. In the first 12 months before NIMART rollout, every month the referral hospital facilities were initiating an average of 389 patients (SD 82.27). This decreased to a monthly average of 238 patients in the 12 months after NIMART (Fig. 2). In the first 12 months before NIMART rollout, the mean number of patients initiated monthly on ART in Region F stood at 580 (SD 80.48). In the 12 months following NIMART, initiations increased significantly (Fig. 3) to a monthly mean of 732 (±SD 71.29). Fig. 2 visually displays the number of ART initiations at Region F PHC referral hospitals. The trend was stable before intervention and decreased steadily after NIMART rollout. In Fig. 3, ART initiations are shown to steadily increase, even though there is a visible interruption after initiation of NIMART. To assess chance and control for other effects, a time-segmented regression analysis was fitted. Results are set out in Table 1. Results from the segmented time series model presented in Table 1 show that initiations at referral facilities gradually decreased after introduction of NIMART, while the total initiations in Region F were increasing. 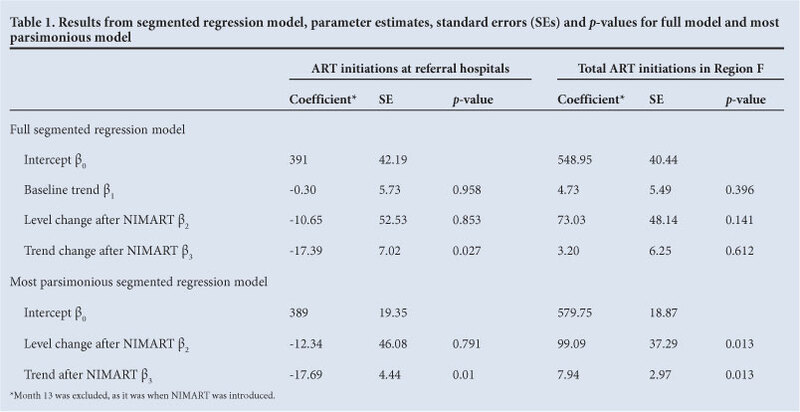 Model (a) presents a full segmented model, which shows that the month-to-month decrease in number of initiations in the Region F referral hospital before NIMART was non-significant (p=0.958). After NIMART, the number of initiations dropped by 11, with a month-to-month decrease of 17 (p=0.027). For the total initiations in Region F, no model term was significant; the non-significant terms were eliminated by stepwise elimination and the most parsimonious model introduced. Model (b) is the most parsimonious model, and shows that initiations at the referral hospital had an average month-to-month decrease of 18 (p=0.01). The total initiations decreased by 12 (p=0.791) immediately after NIMART introduction, a result that was not statistically significant. In addition to a decreasing trend in referral hospital initiations, the total number of ART initiations in Region F PHCs increased by 99 (p=0.013) immediately after NIMART, the trend afterwards showing an average increase of 8 (p=0.013) every month. The key finding from the study is that decentralisation of ART initiation through NIMART in Region F in the CoJ was shown to significantly increase uptake of ARVs by an average of 99 patients immediately after rollout (p=0.013). This is consistent with findings from other studies, as rolling out NIMART to PHC facilities meant less distance for patients to travel and fewer levels of referral for ART initiation, potentially leading to an increase in ART patient retention and access to services. [7,8] However, since patient dissatisfaction with lack of trained HIV clinical staff, negative patient-nurse interactions, compromised confidentiality and stigma at lower levels of ART services had been highlighted, better mentoring and support for nursing staff are called for. Rolling out NIMART led to a steady reduction in the number of patients requiring initiation of treatment in the main referral health facility. This decrease translated into more complicated cases being managed at the referral site. The advantage of primary health care involvement at a local level in ART service delivery, especially in resource-limited settings, has been emphasised previously. [7, 18] However, there is a need for proper guidelines for upwards referral of complicated cases to prevent unnecessary delays. Providing ART initiation without increasing the available human and space resources resulted in an increased workload at primary health clinic levels. Staff shortage and lack of sufficient consulting rooms has been documented as a barrier to rolling out NIMART. [15, 16] It is therefore important to ensure capacity building and training and mentoring of nurses to integrate HIV services in order to reduce workload and provide a comprehensive package of care to patients. Partnership with the DoH/CoJ proved integral to increasing outputs as well as to sustainability of the NIMART programme. The main study limitation was that we used public health facility data, which are sometimes incomplete; however, data quality tracing and verification were applied in order to verify the DHIS data with the PHC data sources. In order to promote accessibility of ART services, there is need to decentralise services to PHCs through training and mentoring professional nurses in ART initiation. ARV initiation of non-complicated cases at PHCs will reduce the workload of referral hospitals, enabling them to concentrate on complicated cases. It is important to capacitate nurses to integrate HIV services in order to maximise the limited human resources and provide a comprehensive package of care at PHC level. To ensure sustainability of NIMART, partnership with DoH/CoJ partners in mentoring should be prioritised. Conflicts of interest. None declared. Authors' contributions. JCYN conceived the research topic, and was involved in designing the study, data collection, analysis and report writing. She was also central to development, revision and finalisation of the article for submission. EM performed data analysis and interpretation, wrote sections of the methods and results, and critically revised the manuscript. SM was involved in managing all the data quality issues, and managed the DHIS data and monitoring and evaluation of the project. MR was district manager for the quality improvement team and participated in all processes. All authors read and approved the final manuscript. JCYN is the guarantor of the manuscript. Acknowledgements. The authors would like to thank the WRHI District Approach to Systems Health (DASH) programme staff, namely Mamotho Khotseng (provincial head) and the quality improvement mentors, Marietta Booysen, Alinah Denge, Didi Mojapelo, Martin Motimele and Teboho Kekana, for their significant role in training and mentoring of the partners. Special thanks go to Alfred Musekiwa, a WRHI statistician, for his enormous support in data analysis and interpretation, and Region F DoH and CoJ partners for their co-operation and hard work in rolling out NIMART.